Skype Mathew Whant on: mwhant. Volcan Pacifica, SA. has been subjected to serious criminal activity. 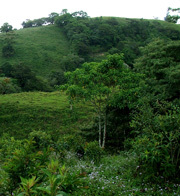 As a result criminal and civil legal action has been initiated through the Panamanian Courts to ensure alleged illegally transferred land assets are returned to their rightful shareholders and clients of Volcan Pacifica, SA. Mountain life: Volcan Pacifica provides 164 acres (67.5 hectares) of the finest Chiriqui Real Estate, high-quality mountain properties (villas and family homes) close to Volcan town, in Chiriqui Province, Panama. Here you can expect an excellent quality of life, with all the benefits of living in a secure, beautiful, remote mountain community - whilst enjoying permanent Spring-like temperatures in the cloud rainforest. Update! November 2008: We took a Helicopter Tour of Sunset Point. Sunset Point, Bocas, started four years ago, is our premier waterfront-based community, located around two custom-built canals: The only other canals to be built in Panama in recent times. Why not come and see for yourselves - you'll be made most welcome. The MSP (Master Site Plan) for Volcan Pacifica has now been separated into Phase 1 and Phase 2. See the overlay of an aerial photograph for a clear rendering of how the properies are to be laid out. Spanning 164 acres the foothills of Panama's tallest mountain, Volcan Pacifica is a gated community designed with an emphasis on positive coexistence with the surrounding flora and fauna. By retaining a high percentage of cloud-rainforest (surrounding and winding down through the property), the mix of single-family home sites, mountain villas and eco cabins will always retain their own privacy. The tallest peak in Panama: At 11,400 feet Volcan Barú (or simply "Barú" to the locals) is the highest mountain in Panama, and an ever-present, imposing andesite giant on the landscape and culture of Volcan. Early morning is often the best time to see it, as it is common for the mists to accumulate round the summit in the afternoon sun. In a nutshell, Panama is probably the best place in the world to which to relocate. It is even better if you choose to retire here, with a government-backed program to assist in making that a reality. Also, crucially, the locals are friendly and welcome this official initiative. And if it's a cool climate and an agricultural community then properties in the cooler Volcan area, mountain-situated, Chiriqui real estate, is ideal. As the Panamanian government continues to encourage growth and development, many real-time rewards are available to the foreign investor. And one of these, Panama's much vaunted 20-year property tax exemption policy, was recently extended. However, whilst the deadline to qualify for the new exemption was originally set at December 31st, 2009, officials recently retracted the date by six months. 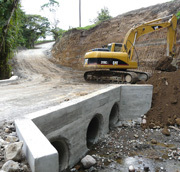 April 2008: The Entrance Road to Volcan Pacifica takes a step nearer completion this month, with the building of a bridge over one of the four rivers which run around/through Volcan Pacifica. Copyright 2008-2009: The DreamScape Group: specialists in Chiriqui real estate and Bocas del Toro real estate. Website validates for XHTML 1.0 Strict and CSS.